Our last Bee Night was on Monday, October 15. 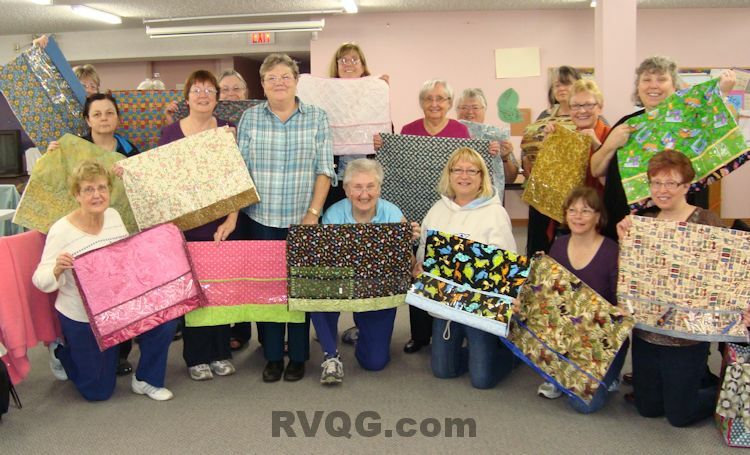 Terry Skelton helped an enthusiastic group of 18 guild members make quilted sewing machine mats. There was such a variety of colours and prints. It was obvious from the conversation and laughter that everyone had a good time! The next Bee Night will be on Monday, November 12, 2012, from 7:00 to 9:00 pm. We will be making a colourful Christmas stocking which is easily made, starting with strips of your favourite Christmas fabrics. See the photo below. 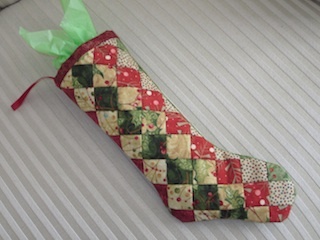 You will receive a Moda pattern called “Secret Santa Stocking.” Surprise a friend or family member with a gift tucked inside this delightful stocking. Sign up at the October general meeting. For general information about Bee Night, including the schedule for the rest of the year, please visit the Bee Night page. Lisette Wins McCall's Quilt Design Star!